I’m all for nourishing the soul with food, and this is one of my all-time favourite recipes. 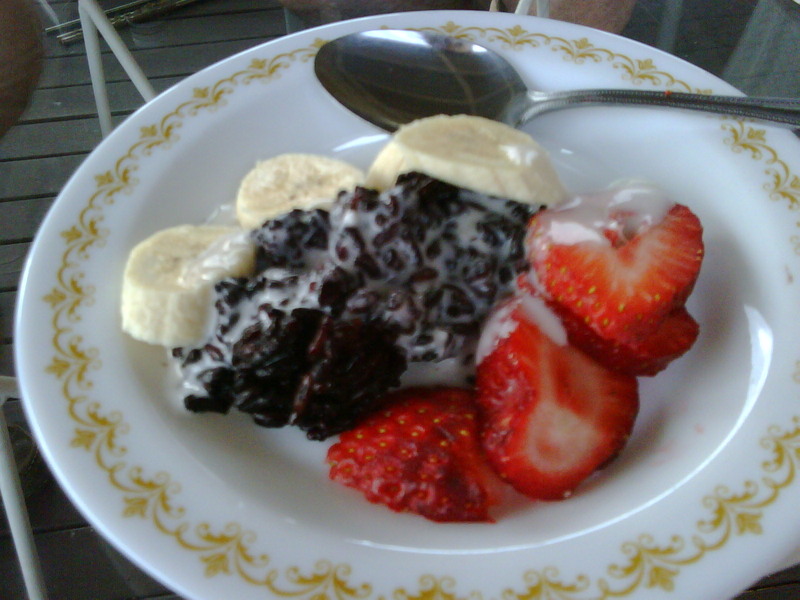 This rice dish can be eaten for breakfast, or as a dessert. In fact, it’s good anytime. Soak the rice overnight (or at least 6 hours) in the water in a ceramic or glass dish. The water will go a nice shade of purple – try not to get it on you as it will stain some fabrics. Many people suggest you discard the soaking water, rinse and start over, but then you’d lose many of the minerals and anti-oxidants that have leached from the water overnight. Transfer to a suitable saucepan and place on the heat. Bring to the boil, stirring occasionally, and then reduce the heat to low, and cover. Cook for a further half an hour to forty-five minutes, until the rice is soft and the mixture has thickened. You need to play this by ear a bit, as you might need to add a little more water and cook longer. It all depends on the rice. Cool slightly and then serve in bowls with more coconut milk/cream drizzled over the top. Sliced banana or tropical fruits such as papaya or mango are also good. In winter I may use berries. 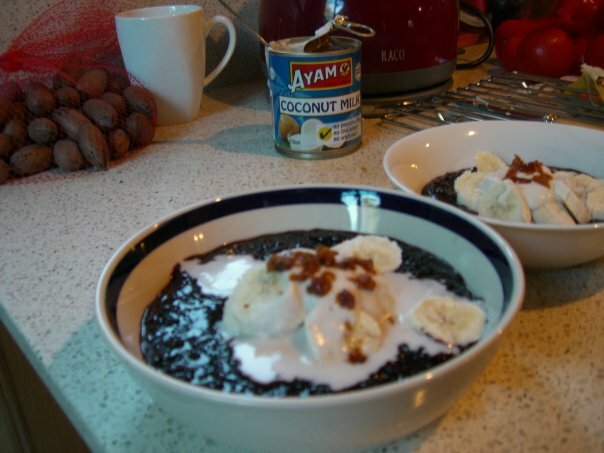 Right now I am also using a big dollop of coconut yoghurt (yoghurt made on coconut milk!) from a company called Co Yo, which is divine. Nutritional Info: A great recipe – gluten free, full of fibre, anti-oxidants and a whole lot of nurture-y goodness. Black rice is a source of amino acids, iron, zinc, copper and according to Traditional Chinese Medicine (TCM) is great for supporting and nurturing the liver and kidneys, two organs/energy centres that get very depleted during times of stress, illness or depression. It’s great food for people with burnout or adrenal fatigue as it is warm and easy to digest. Coconut is also good for low thyroid function and boosting slow metabolisms. This entry was posted in Gluten-free and tagged adrenal fatigue, anti-oxidants, black rice, burnout, gluten-free breakfast, nurture, recipe, soul food, thai sticky rice by Cauldrons and Cupcakes. Bookmark the permalink. If you have a slow cooker, simply mix 1 cup of black glutinous rice with 4 cups of water, and cook in high for about 3 hours. Then add sweetener after, and only add coconut milk in individual servings. With this method, you don’t have to pre-soak nor watch your cooking.